Its model number and name are #015 / Werewolf By Night. Character Bio - Victim of an ancient family curse, Jacob Russoff has battled with his bestial alter-ego for most of his life. 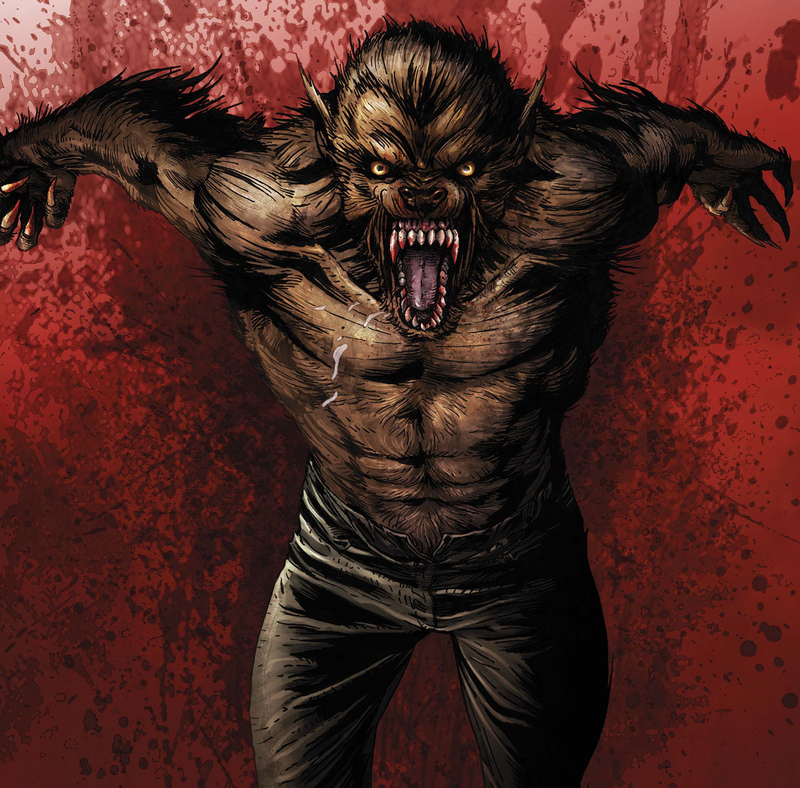 Known simply as the Werewolf when in his savage state, Jacob fights viciously and has been known to lose control, going into a frenzy and killing the target of his rage. Jacob sought for a long time to find a way to control his bestial form, but only by embracing it as a part of himself has he been able to gain full control over both his lupine and human sides. Now he fights evil as Jack Russell by day, and Werewolf by night! As a Creature, Werewolf has these Creature Synergies. As a Lycanthrope, Werewolf interacts differently with these special powers. As a Creature, Werewolf interacts differently with these special powers. Werewolf cannot choose an Android for his Feral Hunting special power. Current Androids. Last edited by Ronin; October 23rd, 2018 at 12:58 AM. Before taking a turn with Werewolf, you may choose any other figure on the battlefield that is not an Android or destructible object and add 1 to Werewolf's Move number for each Wound Marker on the chosen figure's card, up to a maximum of +2 for Feral Hunting. If you do, Werewolf may attack only the chosen figure this turn and must attack once for each Wound Marker on that figure's card at the start of this turn, if possible. Werewolf cannot attack more than 3 times in a single turn. Instead of his normal move, Werewolf may use Stealth Leap. Stealth Leap has a move of 3. When counting spaces for Stealth Leap, ignore elevations. Werewolf may leap over water without stopping, leap over figures without becoming engaged, and leap over obstacles such as ruins. Werewolf may not leap more than 12 levels up or down in a single leap. When using Stealth Leap, Werewolf will not take any leaving engagement attacks. After taking a turn with Werewolf, remove 1 Wound Marker from this card. Before taking a turn with Werewolf, you may choose any other figure on the battlefield that is not an Android or destructible object. Add 1 to Werewolf's Move number for each Wound Marker on the chosen figure's card, up to a maximum of +2 for Feral Hunting. If you do, Werewolf may attack only the chosen figure this turn and he must attack once for each Wound Marker that was on that figure's card at the start of this turn, if possible. Werewolf cannot attack more than 3 times in a single turn. Instead of his normal move, Werewolf may Stealth Leap. Stealth Leap has a move of 3. When counting spaces for Werewolf's Stealth Leap movement, ignore elevations. Werewolf may leap over water without stopping, leap over figures without becoming engaged, and leap over obstacles such as ruins. Werewolf may not leap more than 12 levels up or down in a single leap. When moving with Stealth Leap, Werewolf will not take any leaving engagement attacks. Last edited by Ronin; February 12th, 2018 at 06:51 PM. Personally, I think the last is my favorite, followed by the top one. Don't know the character, seems a little strong in the base stats. Should he be similar to Werewolf?? I'd drop defense by 1. This guy's most frequent opponent is Moon Knight, right? They should be somewhat comparable in stats/survivability. My only other concern would be that with this power set he seems like a very honed in cruise missle you point at someone and he never turns back. Is that accurate to the character? Aren't werewolves kind of known for their bloodlust and lack of discretion? (In fact, classic wolfmen were said in fact to always hurt the ones they held most dear... that's what made the curse so terrifying). I don't know this character too well, so take it with a grain of salt. Feral Hunting has a couple things I'm not clear on: 1) are the additional attacks optional or not? And 2) If he was to choose an unwounded figure, then run in and wound that figure on his first attack, would he then get the additional attacks? It appears that is his super name, although I have contemplated just calling him Werewolf and letting his Secret Identity differentiate the two designs. He is already pretty similar to the Werewolf design, I think Margloth may be right and a slight defense drop might be in order here, but I definitely do think he should be better than a generic werewolf. Honestly, I have no clue who his most frequent opponent is. From his wiki he seems to face a hodgepodge of opponents. As to the whole go wild and attack everyone thing, he fights his feral nature but occasionally succumbs to it, so maybe something making it difficult for him to disengage someone? 1) No, they should be a must. Should probably add in that wording. 2) I'm fine with it activating if he did not get the move boost as that seems a very feral thing to do. I think just "Werewolf" is fine for his name. It's like "Amazing Spider-Man" or whatever, applies more to the comic than the character. Could probably use a bit of a nerf but he should definitely be a class above the generics. Here is where we currently stand with what changes will be made once the breathing period is up. Before taking a turn with Werewolf By Night, you may choose any figure on the battlefield that is not an Android or Destructible Object. 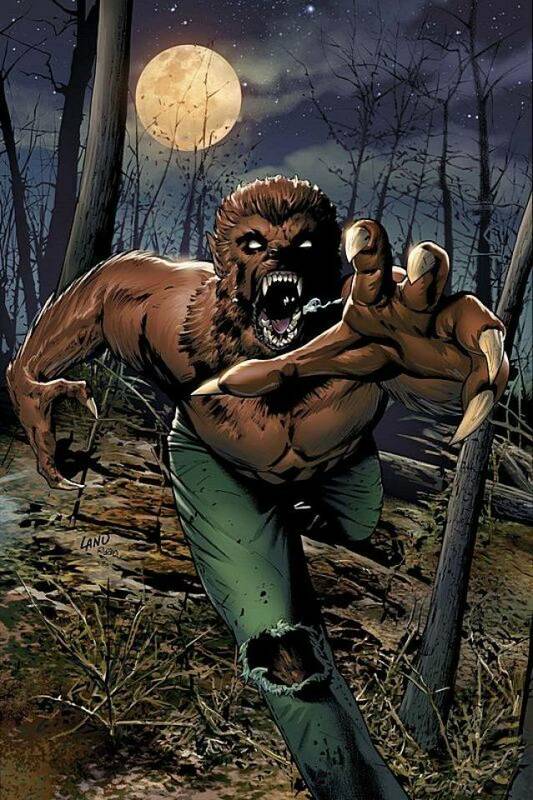 Add 1 to Werewolf By Night's Move number and he must attack 1 additional time for each Wound Marker on the chosen figure's card, up to a maximum of +2 for Feral Hunting. If you do, Werewolf By Night may attack only the chosen figure this turn. Instead of his normal move, Werewolf By Night may Stealth Leap. Stealth Leap has a move of 3. 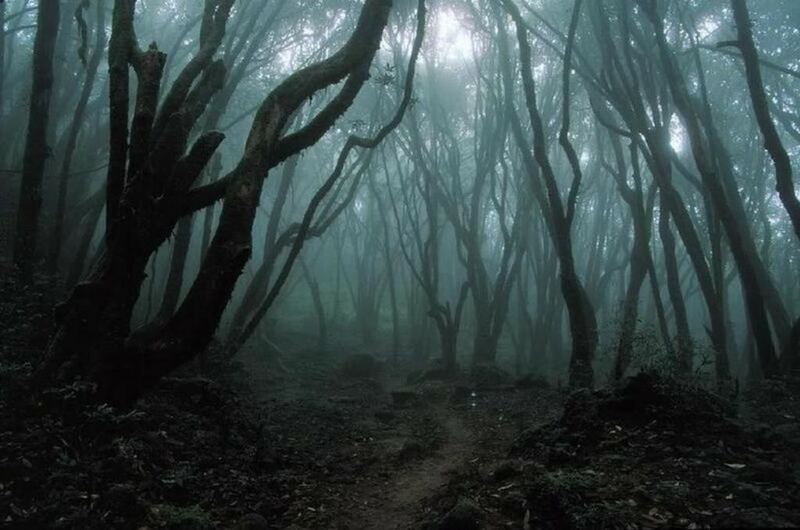 When counting spaces for Werewolf By Night's Stealth Leap movement, ignore elevations. Werewolf By Night may leap over water without stopping, leap over figures without becoming engaged, and leap over obstacles such as ruins. Werewolf By Night may not leap more than 12 levels up or down in a single leap. When moving with Stealth Leap, Werewolf By Night will not take any leaving engagement attacks. After taking a turn with Werewolf By Night, remove 1 wound marker from this card. A) I thought his name was Jack Russell, B) I loved this guy as a kid. My friend collected his adventures and would let me read them. C) He had kinda a wandering anti-hero thing, like the Incredible Hulk show in the late 70s. D) A simple answer to the name issue: when you looked him up, did you find him under Werewolf or Werewolf by Night? Do you think the whole wandering anti-hero theme comes across? If not, do you have any suggestions on that front?